Supplies used: Magnolia papers & overlays by My Mind’s Eye, Close to My Heart flowers, Making Memories Shimmer Alpha stickers, American Crafts Glitter Brads, and unknown journaling paper. Sketch from My Sketch World. 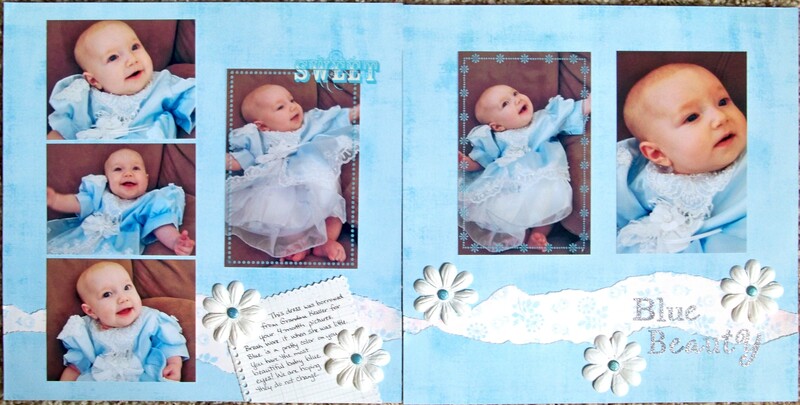 The June Challenge over at Scrap Our Stash is “Something old, something new, something borrowed, something blue”. You can interpret this however you want, in part or full. I knew exactly what I wanted to do for this challenge, or at least the pictures I planned to use. The BLUE dress is OLD and BORROWED for my beautiful NEW baby. Let me tell you, I just love it when things work out like I envision them! I wanted a soft, elegant feel to my layout with these photos. I found the perfect paper to match her dress and everything else just fell into place after that. I used some NEW paper (an unopened pack anyway!) and combined that with some OLD embellishments in my stash.